Have you decided to add outdoor fitness equipment to your park or school campus? Since you want people to use the equipment, you need to choose the perfect location for the whole set. Here are three tips on selecting the perfect spot. In an open space: Be sure to pick an area with enough space for a cluster of equipment. You will need at least 300 square feet for a small fitness area and approximately 2000 square feet for a large fitness area. To make the purchasing process a bit easier, most of our fitness furniture is sold in kits ranging from 3 to 15 pieces per kit. Separating individual pieces of equipment makes it harder for people to gather around the equipment and mingle. 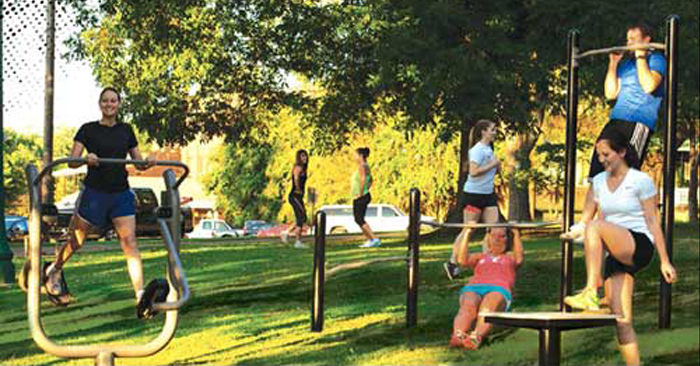 One of the benefits of outdoor fitness equipment is the way it encourages socializing. People from all walks of life can use the equipment and strike up a conversation. At the end of the trail: It might be tempting to have equipment along a popular jogging path so people can use it as they run. However, many joggers prefer working out at the beginning or end of their jog. This allows continuity during their run. In a main area: You want people to easily find your outdoor exercise equipment, especially people who may not have other places to go for exercising. If you place your fitness area in a remote, off-the-beaten-path location, then people will be less likely to use the equipment. When it is visible, there is no limit to the amount of passersby who might stop and try it out. Your outdoor fitness equipment will become a vital part of improving the health of people in your community. If you are ready to add outdoor fitness equipment to your park, community, nursing home or campus, please contact us.